What should I see in Peru? Peru travel expert Tom gives travel tips and his top places to visit in Peru for 2018. He writes: “Peru is one of my favourites places for a holiday – there is variety, so many attractions plus wonderful food. “If you can only go once, these are the best places for a tour. You’ll need two weeks for the first four, which are all in the south, and then at least a week more to add on a hike in the north. A short 1-hour flight from Lima brings you to the white city of Arequipa. This is a great place to start to acclimatise to the high altitude – at 2,350/7,709ft it’s high enough to feel the thinner air, but usually not too lofty to cause serious breathing problems. Arequipa has some wonderful restaurants, lovely old colonial streets, hotels and churches and a pleasant climate. At night there are cool bars to hang out in, with some good microbreweries, too. 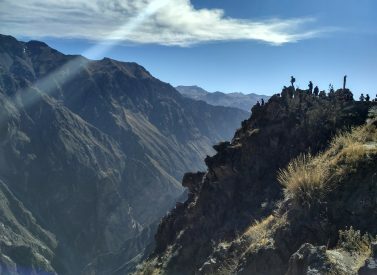 A 4-5 hour bus ride away lies the enormous Colca Canyon, THE place to watch Andean Condors close up, gliding on thermals. Lively Puno is the gateway town to the famous lake, much higher than Arequipa at 3,827m/12,555ft. You’ll find distinct cultures and the incredible Uros floating islands, made of reeds. You can overnight with a host family on these marvels, or for those wanting surer ground, sleep on Amantani or Taquile islands. Each community has its own distinct culture and they all feel different to anything else you will encounter in Peru. Conditions can be basic but as long as you are prepared for some small discomfort (shared rooms/bathrooms, no showers), this can be one of the more adventurous and rewarding parts of your Peru holiday. No visit to Peru is complete without a few days in world famous Cusco. Beautiful colonial buildings, lovely restaurants and some of the best hotels in Peru add to the delightful travel experiences nearby including Machu Picchu. Markets, churches, rafting, chocolate making and much more – Cusco has something for everyone. For a more relaxed stay, the Sacred Valley is a 1-2 hour drive from Cusco. Resorts and hotels have made the most of the wide open spaces and offer spas, gardens and tranquillity. Peru is an enormous country and more than half of it is covered by Amazon rainforest. There are a multitude of comfortable eco lodges easily accessed by a 30-minute flight from Cusco or by travelling overland. Native guides get you close to wildlife – monkeys, macaws and for the lucky, jaguars – as well as explain the local tribe’s cultures and harmonious life with the forest. family friendly trips or camping in Manu. Peru has some of the best trekking in South America, indeed the world, and Huaraz is at the heart of all things hiking. From Huaraz you can see the Cordillera Blanca and Negra range spreading out before you. Choose to hike from 4 to 14 days among the valleys and passes of the ice-clad giants. The famous Huayhuash circuit is close by, too, possibly the best trail in all of Peru.